Electric cars will be so affordable and have such a long range between re-charges that petrol cars will not be able to compete in the next generation of cars, Mitsubishi Motors Corporation president Osamu Masuko predicts. He said car and battery manufacturers were working on a seven-fold increase in battery capacity, increasing potential car driving ranges to more than 1000km, and major reductions to battery cost, one 20th of 2009 prices, that would drive the growth in electric cars. He likened the rise of EVs to that of mobile phones, which had had a major impact on old style land-line telephones. “The world is changing, and it is definitely advancing, this battery technology,” he said. Mr Matsuko said the lithium-ion batteries for an electric car in 2009 cost as much as a Toyota Yaris, but had more than halved since. He said the Japanese government had a target to reduce the cost of batteries for cars to one 20th of the price of the 2009 variety, and with seven fold capacity. A 2009 electric car could travel 150km, he said, meaning the EV of the future should do more than 1000km. 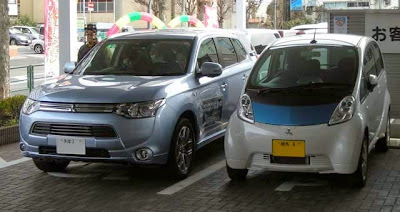 Mr Masuko said Mitsubishi would not be able to meet future fuel consumption and emissions regulations in the United States, Europe and China if it did not introduce electric and PHEV cars into its mix. He said car companies who failed to meet the regulations would have to pay penalties. “Paying penalities is not realistic,” he said. Mr Masuko said the fact that China – along with Bolivia and Chile – controlled one of the few sources of raw lithium for the making of current batteries was a concern, meaning the product was often used as a political bargaining tool. However, Kazakstan supplies were now coming on stream, reducing the risk of supply instability, he said. In the longer term, new battery substances possibly would further reduce the reliance on Chinese lithium, he said.